I remember during my freshman year, having odd gaps of time in my schedule. I tried to study, but there wasn’t quite enough time to be productive. I thought about getting coffee, but living on a limited budget, it didn’t seem practical. After becoming more familiar with my classmates and their schedules, I found a group of students that shared my chemistry lecture and calculus lecture—they were classes separated by an awkward 90 minutes. A few days after we began sitting with each other to fill the time, we decided to explore. One adventure led to the next, and before we knew it, we were coming to know our new campus inside and out. Taking the time in between classes gives your mind time to relax and think more creatively, and, as you explore you will find yourself building a more meaningful connection with your home campus. Below, I’ve given you a list of five of my favorite buildings and places on campus to sit, relax, and take a study break in between classes. My hope is that after these five, you will begin to identify your own favorite places on campus, and continue to explore them. 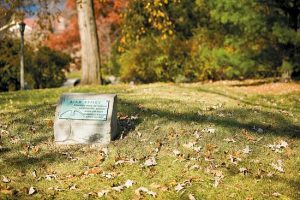 Effigy Mounds: tucked behind the historic Agriculture Hall, sacred burial mounds serve as a reminder of the people who inhabited the land before us. Click on the image to learn more about the effigy mounds. 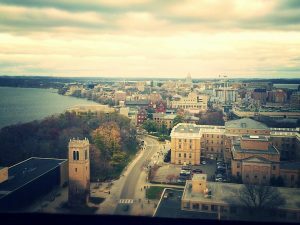 Van Hise Floor 19: as one of the top 50 tallest educational buildings worldwide, the view from the top is unbeatable. Bascom Hall entry way: we all know Bascom Hall as a centerpiece to our University, to be a real Badger, you should probably know about the building’s history. Check out the displays. Be sure to READ MORE HERE before making your stop. 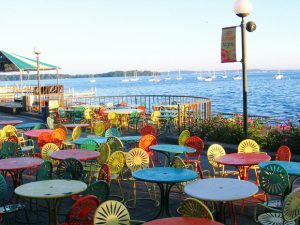 The Terrace: go, take a breath, and for minutes escape the stresses of school surrounded by your fellow classmates. Science Hall: the building is charmed with ancient staircases and deserted offices giving your adventure a thrill. Some will tell you the building is haunted from the bodies that once were held in the upstairs anatomy lab—I’ll let you make that determination for yourself.